We would like to invite you to visit us at our booth (#707) at the National Rx Drug Abuse and Heroin Summit that will be held in Atlanta April 2-5, 2018. The National Rx Drug Abuse & Heroin Summit is the largest national collaboration of professionals from local, state, and federal agencies, business, academia, clinicians, treatment providers, counselors, educators, state and national leaders, and advocates impacted by prescription drug abuse and heroin use. Rural Development, Elinore F. McCance-Katz Assistant Secretary, Substance Abuse and Mental Health Services Administration and many others. 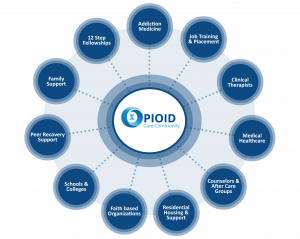 We will be introducing our new Opioid Care Community software applicationat the Summit – the first of its kind software system to help communities of all sizes accelerate their efforts to solve the Opioid/Substance Abuse disorder crisis from prevention to treatment to recovery. Our software is designed to support popular models for coordination opioid and substance abuse treatment and recovery – such as the Hub and Spoke Model and the Recovery Oriented Systems of Care (ROSC) – see diagram below of ROSC model. Recovery – Maintain listings and facilitate transitions from treatment programs to recovery programs. Fully support the coordination of necessary wrap around services to help reduce relapses and promote full recovery. Come visit with us next week. If you can’t visit us at the Summit – call us for a free discovery session to help us better understand your needs for solving the opioid substance abuse epidemic in your community.